No. 4 seed Florida State hit two tough shots at the end of regulation and in overtime to beat No. 5 seed Virginia Tech 65-63 on Thursday afternoon at the ACC Tournament in Charlotte. It was Tech’s second overtime loss to FSU in nine days. The Hokies are now 24-8 on the season, and they’ll find out their NCAA Tournament fate on Sunday night. The Seminoles improved to 26-6, and they’ll face No. 1 seed UVA in the semifinals on Friday night. Virginia Tech fell down 17-4 in the first half, and also missed their first 12 three-point attempts spanning both halves. 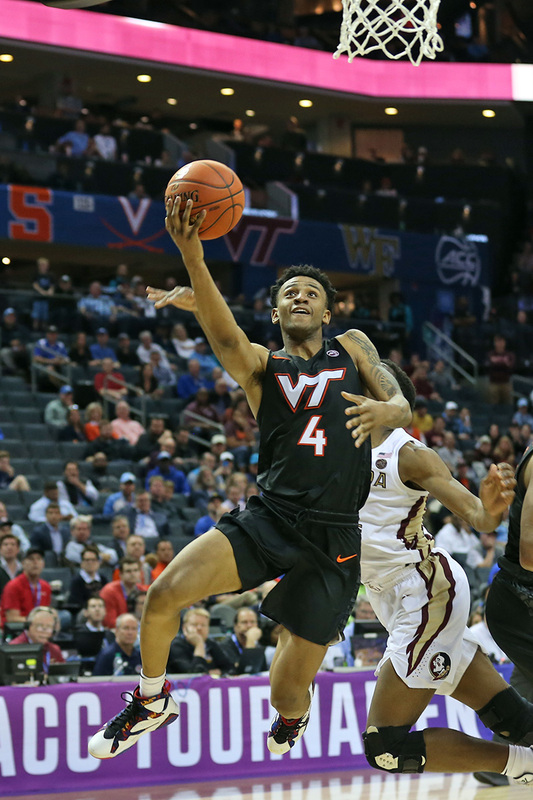 Despite that, the Hokies were able to rally and take a late lead in both regulation and overtime before the Seminoles hit a pair of very tough shots to break Tech’s heart and end their ACC Tournament run. After trailing the entire game, Virginia Tech tied the game at 50 on a layup by Nickeil Alexander-Walker with 2:47 remaining, but Florida State responded with a tough three-pointer from the corner by redshirt senior Phil Cofer. That was the first of many big shots the Seminoles hit when they really needed it. The Hokies then went on a 6-0 run and took their first lead of the game. Kerry Blackshear scored in the paint to make it 53-52 Florida State, and then Alexander-Walker found Blackshear under the basket for a wide open dunk to put Tech up 54-53 with 1:16 remaining. After Florida State missed their next shot, Blackshear again hit a jumper in the paint with 18 seconds remaining, and he was fouled. The free throw would have made it a four-point game, but he missed. Out of timeouts, Florida State moved the ball up the court and got off a three-point attempt, which missed. There was a scramble for the rebound, but the ball went out-of-bounds off Alexander-Walker with 6.7 seconds remaining. Buzz Williams called a timeout to set up his defense, but that also gave the Seminoles a chance to set up a play as well. They managed to inbound the ball in the corner to freshman Devin Vassell, who despite good defense from Isaiah Wilkins, nailed a tough three-pointer to tie the game at 56. 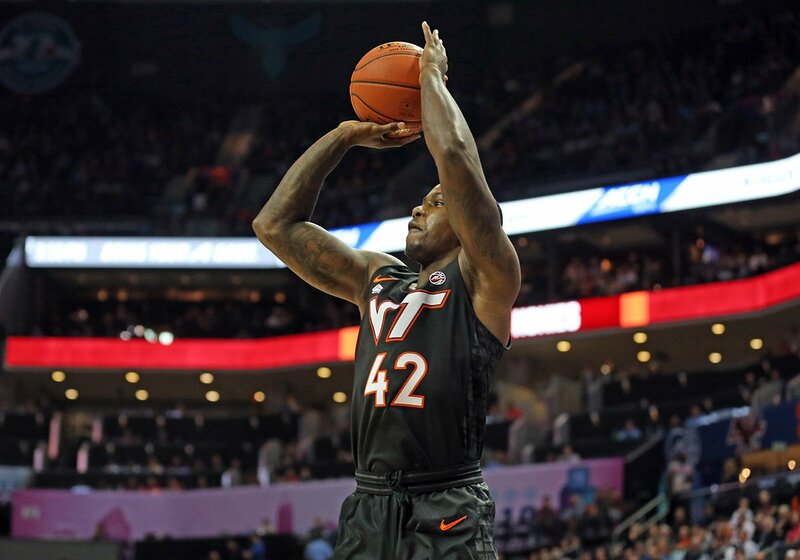 Vassell came into the game averaging just 9.5 minutes per game, but he made four three-pointers against the Hokies. The Hokies inbounded with 4.5 seconds left, but the best shot they could get was a Kerry Blackshear heave from halfcourt, which was no good. The game headed to overtime. Florida State took a quick two-point lead, but Virginia Tech quickly rallied to tie the game, and then took the lead on back-to-back shots by Alexander-Walker. His first shot was off a pump fake to give Tech a 60-58 lead with 2:40 remaining, and after FSU tied the game, he hit a three-pointer that got a fortunate bounce off the rim to put his team up 63-60. That’s when Phil Cofer struck again, as the 6-8 power forward hit another tough three-pointer to tie the game with 1:15 remaining. Cofer came into the game shooting 33.8% from three-point range, but he was 3-of-5 against Tech, and none of them were particularly open. The Hokies did not have good possessions down the stretch, with Alexander-Walker missing two shots, including the final one with 11 seconds left. Buzz Williams had two timeouts remaining, but chose not to use them at that point in the game. After Alexander-Walker’s miss, FSU pushed the ball down the court and got it to senior guard Terance Mann. Moving to his right and facing a very tough angle, Mann got up a well-contested shot and made it. It was one of the tougher shots you’ll see in a college basketball game. Tech had one final chance with 1.8 seconds remaining, and Buzz Williams did use both of his remaining timeouts to try and set up a play. The Hokies managed to inbound to Alexander-Walker at halfcourt, who got a decent look considering the circumstances. His shot drew a little iron, but was no good, and Florida State held on. The Hokies got the game they wanted against Florida State. Tech did a great job keeping the ball out of the paint and forcing the bigger Seminoles into three-point shots. 31 of FSU’s 57 field goal attempts were three-pointers. Overall, they were 22-of-57 (38.6%) from the field and 12-of-31 (38.7%) from three-point range. Tech also forced a whopping 17 turnovers while committing just nine of their own, and outscored Florida State 38-14 in the paint (that’s not a typo). However, the Hokies missed their first 12 three-pointers, and though they made four of their last seven, they were just 4-of-19 (21.1%). The bigger issue was free throw shooting in the second half. Tech was a perfect 4-of-4 in the first half, but went just 3-of-9 in the second half. It was an uncharacteristic free throw performance for a team that ranks No. 23 nationally out of 350+ teams in free throw percentage at 75.8%. The Hokies have been even better in ACC play, making 78.2% of their free throws against conference opponents, which ranks No. 1 in the league. Nickeil Alexander-Walker led the Hokies with 21 points, while Kerry Blackshear had 17 points and nine rebounds. Ahmed Hill added 16. Virginia Tech will return to Blacksburg and await their NCAA Tournament fate. The Hokies were considered by the majority of online brackets to be a No. 5 seed headed into Thursday’s game, and most believe they’ll stay there. Fellow consensus No. 5 seed Maryland was upset by Nebraska in the Big Ten Tournament on Thursday, and if any of the No. 5 seeds were to drop to a No. 6, it would be more likely to be the Terps than Virginia Tech, after Maryland’s loss to the Cornhuskers. The NCAA Tournament Selection Show will be televised nationally by CBS on Sunday at 6pm. You can join the men’s basketball team in Cassell Coliseum to watch the show. Doors open at 5pm, and free pizza will be provided to the crowd while supplies last. I hope Justin will be fully ready. Possible to drop to a 6 seed maybe, but hopefully a 5 at least. Three years in a row the Hokies are making the Big Dance. History being made. 1 defender physically located in each 3-point area of corners. 1 defender physically located in 1/3 of area just outside 3-point semi-circle. IMO, the error was not putting a big-man on the in-bounds passer at the end of regulation. The passer had an open pass to the corner where the 3 point shot was made. Can’t fault the team, they have it all they had. Proud to be a HOKIE and proud of VA TECH BASKETBALL!! Outlaw was taken to the locker room during the second half of Wednesdays game. He came back but with no impact. Today, he was seldom mentioned. Is he hurt? Excellent point. 2 shot attempts for Ty in 38 minutes makes no sense. If he is knicked up, then maybe having extra time off to heal up is a blessing in disguise. Hope he regains his form for the big tourney. Nebraska did upset Maryland, won by 8. The Huskers played yesterday and Maryland had a bye and was fresh. Nebraska only played 7 players and most of their scoring was from 3 players, 2 of them played all 40 minutes. Lots of parallels. Granted Maryland is not FSU but Nebraska was 17-15 and a 13 seed. On the season they only shot 34% from 3, 36% today. So, it can be done, tired legs and all. Unfortunately not by us today. Ugh!!! Though we missed a bunch of 3’s, the Free throws gave away the game. And at crunch time, our studs missed. One correction, “Buzz Williams called a timeout to set up his defense, but that also gave the Seminoles a chance to set up a play as well.” Buzz’s timeout didn’t give Seminoles a chance to set up a play, that already had occurred when the referees called an official timeout to review the play and make sure the ball went out off of Alexander-Walker. It was a long delay and Florida State had already huddled up with their coaches before Buzz called his timeout. His timeout was in reaction to the play Florida State had setup during the official review. Buzz still had a timeout left when we had the ball with 20 + seconds left in the OT and the score tied. I wonder why he didn’t call a timeout to set up a offensive play? Blackshear’s final midcourt shot came with about 5 seconds remaining in OT. It seems to me he had time to get much closer for the shot, maybe pick up a foul. That last shot came way too early. Speaking of way too early…NAW’s shot attempt in OT with a tie game and 10 sec left on shot clock and 13 sec left in OT. Shouldn’t have given FSU a chance to take that last running leaner off the glass to win. All in all, as bad as we shot it and were out-rebounded, we had a multiple chances to win it but FSU hit big shot after big shot whenever they needed it. So frustrating. Hats off to coach and staff for adjusting this past month without 5 and still being in top 1/3 of toughest league in the country. Not one media member at the post game interview with VT asked Buzz why he didn’t call a time out when we had the ball with about 20 seconds left in the game and a tied score. Buzz not calling a time out at that time stumps me! Let’s win some games in the NCAA MBB tournament! With a 3 point lead & FSU ball with 6 seconds in regulation, why in the world would you not foul the inbounds pass. At best FSU could get 2 points. Possible to get 3 points (or 4) if they rebounded a missed 2’nd free throw & hit a desperation shot. Hard to understand??? I thought Buzz gave a very thoughtful and detailed explanation of what they wanted to happen vs what actually happened in the postgame press conference.